Less than an hour by fast train from London is Cambridge, one of the two most famous university cities in the United Kingdom, the other being Oxford. It is an ideal place for a day trip from London or a short break. Dating back to the 13th century, the best time to visit is in early spring or the autumn when there are less crowds. There is a great deal to see in Cambridge and everything is within walking distance. There is always something going on and new things to investigate. 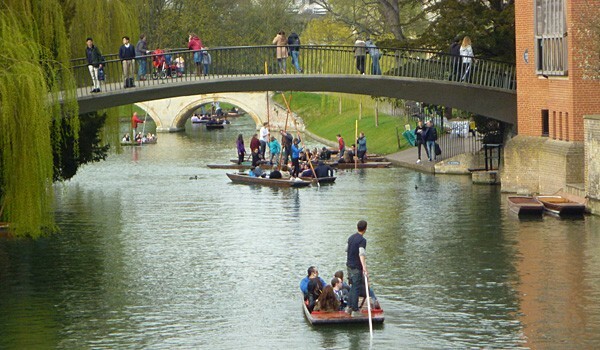 The River Cam passes almost through the centre and it is still possible to walk around many of the colleges without a charge. One of Cambridge’s main advantages is that everything is close by so make sure you pack a good pair of walking shoes. There is an excellent bus service into the town from the main line station which takes just a few minutes and drops you at the bus station in the centre. Do not be put off by the large amount of development taking place around the station as the city centre has lost none of its character or charm during this development. It should be remembered that Cambridge is also a hub for hi-tech development and is sometimes affectionately known as “Silicon Fen” by the locals. From the bus station you can walk, in just a few minutes, to most of the colleges as well as visiting the famous, free Fitzwilliam Museum, that houses works by Picasso, Cezanne, Monet and many others as well as some mind blowing sculptures by Degas and Rodin. It is easy to get around and the building in itself is quite superb. Although some of the colleges now charge to go in, you can still pick up a leaflet indicating the free ones from the main tourist office in the Market Place. The colleges are all around you and it is often difficult to choose which ones to visit. Trinity is a good place to start and then perhaps Christ’s College and Emmanuel. Peterhouse, next to the Fitzwilliam Museum is the oldest college and the head porter, an ex-military man who works at the lodge, is extremely helpful. Remember to check when the main exams are taking place as many of the colleges close their doors during this time. A walk along the Backs is well worth considering as it will give you another view of the city. You will find several college entrances which will then take you across the river and back into the city. 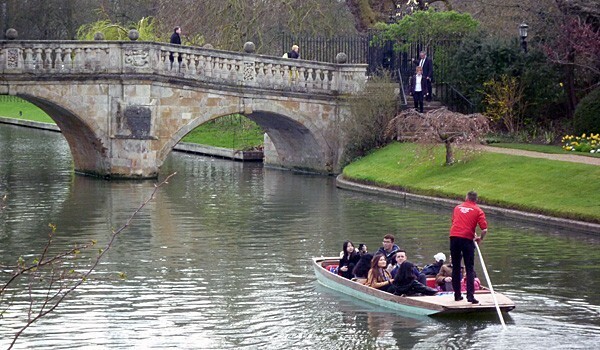 If you can, try to take a punt, which is a Cambridge tradition. Punts are flat bottomed boats that can be hired from several points along the river. Scudamore’s Punting Company has been around since 1910. They are next to Magdalene College and have some very competitive rates which are often open to discussion! It is best to go out with an expert as it is quite an art maneuvering these craft through the bridges and along the river. There are also some interesting churches in the city including the round 12th century Holy Sepulchre and Great St. Mary’s. Any good guide book will fill you in on the history of these churches. The city is full of amazing buildings which ooze history and everywhere you look there are tiny alleyways and passages which take you between the buildings and often down to the river. Sheep’s Green, just a few minutes’ walk from the centre, is a delightful spot where you can sit and watch the world go by. From here it is an easy walk along the Backs and into the centre. Jesus Green close to Magdalene College is another pleasant spot. 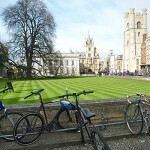 King’s Parade and Trinity Street are great for visiting colleges. If you are interested in a walking tour around the city then the information centre has an excellent map which indicates the best routes to take. Apart from the colleges there are several excellent places of interest including the Polar Museum which concentrates on the Polar Regions and why they are so important to us. Dealing with both the North and South Poles, entrance is free and it is just 10 minutes’ walk from the centre. The Polar Institute, of which the museum is part, was founded in memory of the explorer Captain Scott. A fascinating place, it is well worth considering. If you are staying for any length of time, then a trip to the cathedral city of Ely with its Cromwell links is also worth a visit. Cambridge has an excellent range of independent shops and also the Grand Arcade where you will find most high street outlets and the celebrated John Lewis department store. Do spend some time visiting the shops along King’s Parade, Trinity Street and in Rose Crescent. These include establishments linked to the colleges such as the Haunted Bookshop in St Edwards Passage, college dress shops and places selling and repairing bicycles. The excellent daily market has some great bargains ranging from scarves to vinyl records and various local foods. Because of its academic nature, tourism and the increasing hi-tech industry nearby, the city has plenty of hotels. As always, if possible try to stay in the centre. The Cambridge City Hilton is ideal for those who want to visit all the main sights and are limited for time. It is located next to John Lewis and just a few moments from the shops, the central square, the colleges and the river. 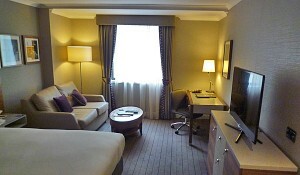 It has recently been refurbished and the rooms are comfortable and well appointed. The staff are very helpful and the hotel provides a substantial breakfast but make sure that you avoid peak times in the morning as it can get very busy. Another good place to try which is on the river is the Doubletree by Hilton just opposite Sheep’s Green, located in a semi-rural setting, but again it is just a short walk from all the amenities. Other hotels and guest houses can be found in the centre and on the outskirts. Being a tourist destination you will also come across plenty of bed and breakfast establishments. One idea that you could try is to stay in a farmhouse or inn. There are several of these on the outskirts of the city in the village of Grantchester, home of the world famous author and politician Jeffrey Archer. These include Manor House Farm in Grantchester and the Lord Byron Inn at Trumpington. 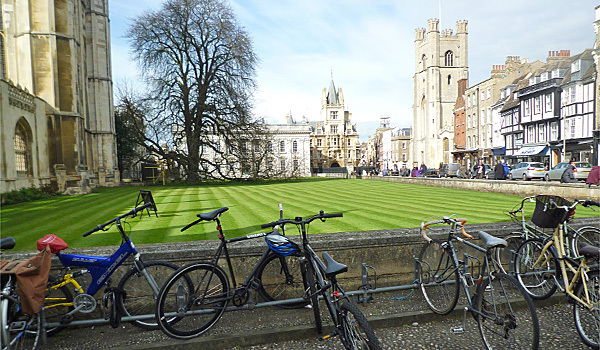 Cambridge is located in the Fens, an area known for its wide variety of vegetables and fruit. Eels are common in the Fens and so you should be able to find somewhere selling smoked eel in Cambridge. An acquired taste, you might prefer to try the Pint Shop just behind the Guildhall. Here you can try a huge variety of beers and also over fifty types of gin including one of my favourites: sloe gin made from wild berries. They also serve a range of meats including onglet and flat iron steaks. You should try their rhubarb crumble and special ice cream, they are delicious. The staff is very friendly and it is always ‘buzzy’. They are looking to open up a restaurant in Oxford very soon. There are lots of cafes in Cambridge including Aunties Tea Shop which is now known as the Senate but run by the same family. Ideally located close to King’s College and near the market they produce excellent scones. For those of you who want to try some of the local vegetables or are vegetarians, look out for the popular Rainbow Café tucked away down an alley in King’s Parade. Dishes include Latvian Potato Bake and Jamaican Roti Cup. All cakes are baked on the premises and they serve Fairtrade tea and coffee. 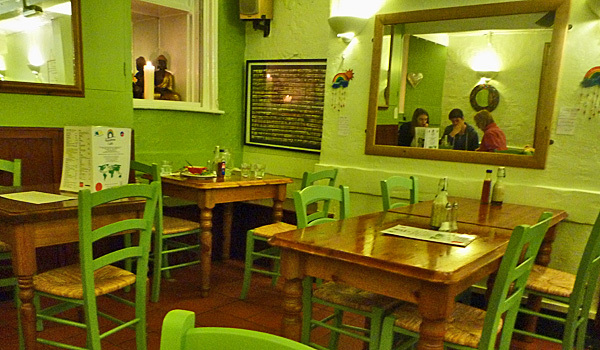 If you want to try one of Cambridge’s famous foods then make for Fitzbillies opposite the Fitzwilliam Museum. Here you can buy the rich and sticky Fitzbillie Bun. This was created in the 1920’s to keep Cambridge students “fuelled up”. 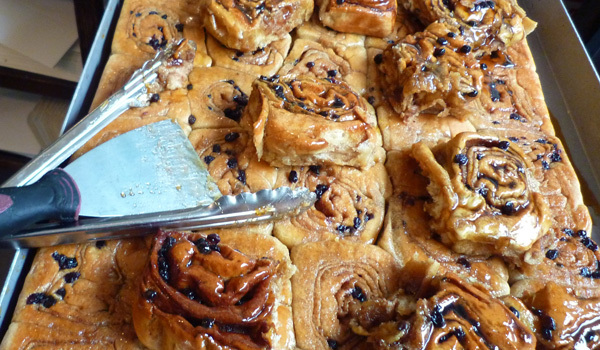 Reminiscent of a Chelsea bun, it will keep you going for quite a few hours! They now have a café as well as the bakery. Being a university city there are plenty of coffee shops and cafes where you can fill up with pastas, buns, pies and tea including the popular Sicilian café Aromi near the bus station. The night life in Cambridge is first class with plenty of public houses and bars. Try the Anchor Pub close to Sheep’s Green. 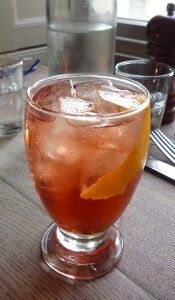 It is small and intimate but has a great atmosphere. Another well know hostelry is The Eagle where Crick and Watson announced their discovery of DNA. Look out for the names scrawled on the ceiling by World War II airmen before they set off on their missions. The Cambridge Corn Exchange and the theatres often put on lots of excellent productions linked to West End shows. The University ADC Theatre is where you are most likely to see the stars of the future and look out for the Cambridge Rock Festival which takes place annually in August. If you are looking for clubs, then go to the main high street. Included in your list of places to try should be the Baroosh Bar and Kitchen. Other cool places to hang out include La Raza and Ta Bouche which opened its doors in 2004 and is now one of the most popular bars in the city. The Cambridge Junction is also famous for its events and known for its live acts. There are many eating places and country pubs along the river just a short drive from the city centre. Further information on what is happening in the city can be found in the Cambridge Visitors Guide which is available free of charge from the information office. Also look out for the excellent Welcome to Cambridgeshire publication which can be found in some hotels. Cambridge has extremely good links by rail and road and Great Northern runs a very good fast non-stop half hourly train service from King’s Cross Station in London which takes less than an hour. Other services operate from Liverpool Street station and the main coach stations. 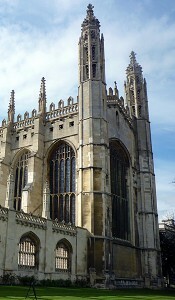 Cambridge is well served by roads and is linked to London via the M11. The bus station in Cambridge is very central; however the main form of transport in the city is the bike so make sure you take care when stepping off the pavement! It is possible to travel on from Cambridge by train to King’s Lynn, Birmingham and London Stansted airport. There is also a comprehensive bus service to many of the local towns and villages. London Stansted is just 30 miles away and served by National Express coach. London Heathrow is an ideal hub to come into from the U.S.
Punting along the river is probably the most unique form of transport in Cambridge and is a popular pastime with students after their exams. More information can be found at the official tourism service for Cambridge. How To Get There: Cambridge is about 50 miles north of London, and if you’re driving, it’s about 1.5 hours. A train from London will take anywhere from 45 minutes to 1 hour 30 minutes, on the Great Northern train lines, with tickets ranging from £35.60 to £48.80 for a roundtrip ticket. Travelers from the U.S. can fly to either Heathrow (LHR) and Gatwick (LGW). Heathrow is located about 15 miles west of central London and the easiest way to get into London is by taking either the 15-minute Heathrow Express (£39 for a roundtrip) or 30-minute the Heathrow Connect (£9.90 each way). Both trains stop at London Paddington Station. More information about area transportation for Heathrow is available at here. Gatwick is approximately 30 miles south of central London. The fastest way to get into town is on the Gatwick Express. For £34.90 roundtrip, you’ll get to Victoria Station in about 30 minutes. A cheaper, but longer option, is the bus. The National Express also stops at Victoria Station, takes between 1.5 to 2 hours and prices start at £8 one-way. easyBus is even cheaper, with one-way tickets starting at £2, and takes a little over an hour to get to Earl’s Court/West Brompton in central London. More area transportation information for Gatwick is available at here. 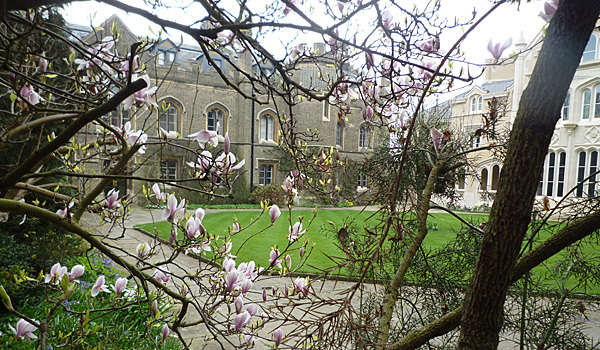 Best Time To Visit: As noted byt the author, early spring and autumn are ideal times to visit Cambridge to avoid the crowds. The weather typically stays relatively nice and dry through October. Winter, like most of the U.K., is wet and cold, although deals are easier to come by.